Earn Rs. 100 Recharge for just answering some questions from Idea Super Challenge Season 12. This time they are giving ₹100 Recharge for free.You just need to answer some questions & collect your Recharge. You will be awarded 10 points for every correct answer. So just give 10 correct answers & Collect atleast 200 points for ₹100 Recharge Coupon code. There is no negative marking for a wrong answer. You will be charged ₹20 for 10 answers. Follow these steps during the ” HAPPY HOURS” & you will get 20 points for every correct answer. That means you will be charged ₹20 After awsering 10 questions correctly , you will get your ₹100 Recharge Code through sms. 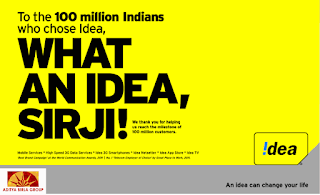 How To Avail This Idea Super Challenge Offer? • Confirm to Redeem Recharge by pressing 1 Key. √That’s it ! You will get Rs 100 Recharge on your Mobile Number.